Investment bankers have gotten used to being asked by worried retail-industry chief executives to pitch takeover ideas aimed at fending off Amazon. Now the fear has spread to media, health care and many other sectors, where CEOs dread the competitive advancements made by not just Amazon but also Facebook, Google and Netflix . The result is an explosion of mergers and acquisitions. Investment bankers have gotten used to being asked by worried retail-industry chief executives to pitch takeover ideas aimed at fending off Amazon.com Inc.
Now the fear has spread to media, health care and many other sectors, where CEOs dread the breathtaking competitive advancements made by not just Amazon but also Facebook Inc., Alphabet Inc.’s Google and Netflix Inc. The result is an explosion of mergers and acquisitions. 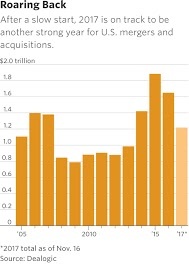 So far this month, about $200 billion of deals have been announced in the U.S., according to Dealogic. November is on pace to be the second-biggest deal-making month since the firm began tracking them in 1995. Three recent deals, either under discussion or awaiting approval, show in especially dramatic fashion the impact of Amazon and other technology giants on M&A activity. CVS Health Corp. could reach a definitive agreement by the end of November to buy Aetna Inc. AET -0.12% for more than $66 billion, uniting two businesses with little operational overlap, according to people familiar with the timing. The possibility that Amazon could enter the pharmacy business jolted CVS executives toward buying a health insurer, which could help CVS make better use of its retail space, people familiar with the matter said. The drugstore operator could sell insurance, draw blood and provide other services that Amazon can’t easily replicate. 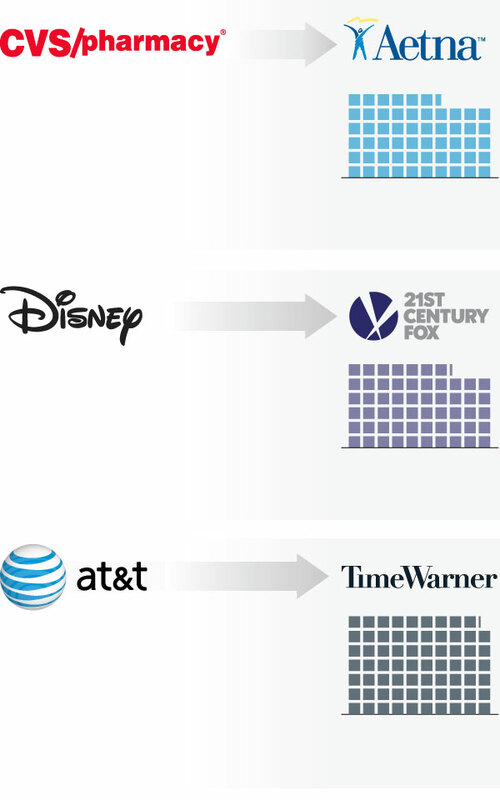 AT&T Inc.’s planned purchase of Time Warner Inc. for about $85 billion would combine a huge but slowing mobile-phone business and the DirecTV satellite-television operation with a content machine that includes Time Warner, the owner of CNN and HBO. Randall Stephenson, AT&T’s chief executive, said the point of the AT&T-Time Warner deal is to create a bulwark against Facebook and Google, which have built “incredibly strong” positions in the advertising market. “That’s what this is about,” he said at an event sponsored by the New York Times. Walt Disney Co.’s expression of interest in a big chunk of 21st Century Fox Inc.’s assets was prompted in part by the success of Netflix, the fast-growing streaming video company, according to people familiar with the situation. Fox has a stock-market value of about $57 billion. Disney’s cable channels are under pressure from cord-cutting. In August, the company announced it will launch two online subscription streaming services with sports, movies and TV programming directly to consumers. Disney said it would yank its future movies from Netflix. “Our goal here is to be a viable player in the direct-to-consumer space, space that we all know is a very, very compelling space to be in,” Disney Chairman and CEO Robert Iger told analysts and investors this month. The Disney-Fox talks stalled, but they appear to have unleashed a wider auction for Fox assets, including its movie studio and international unit. Those assets have drawn interest from Comcast Corp., Verizon Communications Inc., Sony Corp. and possibly other potential buyers, according to people close to the discussions. Every M&A cycle looks different. The boom that crested in 2015 was largely defined by deals between direct competitors trying to gain scale and cut costs. Some firms wanted to lower their taxes by moving their headquarters outside the U.S. as part of a deal. Amazon is growing fast in its existing businesses and expanding into new ones. durable goods, in physical and digital formats. deposits payment into their bank accounts. and has more than a million active customers. acquired Whole Foods Market on Aug. 28.
credit cards and other sales. The number of deals that were agreed to and valued in the double-digit billions of dollars broke records. The signature deal of that era was the megamerger, such as Pfizer Inc.’s agreement to buy Allergan PLC for about $150 billion. The Obama administration later blocked the deal between the two drugmakers. Before the financial crisis, leveraged buyouts dominated the deal environment. During the turn-of-the-century tech surge, companies rushed to make deals that were seen as offensive moves to launch them into new lines of business, like the ill-fated merger of AOL and Time Warner. So far this year, the dollar volume of U.S. mergers totals $1.22 trillion, down 18% from the same period in 2016, according to Dealogic. Investment bankers attribute the decline largely to uncertainty surrounding federal antitrust and tax policy. The recent surge is a sign that other drivers of deal activity are now in control. Debt remains readily available and cheap, and high stock prices often go hand-in-hand with mergers and acquisitions. Shareholders have rewarded buyers in a number of recent deals, which tends to encourage more and is reminiscent of 2015. The biggest deals in the current crop are every bit as big as those from the last boom. Earlier this month, Broadcom Ltd. launched an unsolicited offer for rival chip maker Qualcomm Inc. valued at $105 billion. It would be the biggest technology takeover ever. Qualcomm rejected the offer and said it undervalued the company. It’s still hard for many companies to agree to a merger or takeover, let alone win approval from shareholders and regulators. Sprint Corp. and T-Mobile US Inc. recently abandoned their monthslong effort to combine the third- and fourth-largest wireless carriers in the U.S. Disagreements over control and other issues doomed the talks. Time Warner shares have tumbled since the Journal reported earlier this month that the Justice Department could sue to block the AT&T deal. The lawsuit was filed Monday. Still, interest in deal-making is strong and growing at many companies where competition from technology giants such as Amazon looms. Those tech giants have done few big deals themselves lately, with the exception of Amazon’s purchase of Whole Foods Market Inc. in August for roughly $13 billion. Investment bankers who advise grocery chains say they were flooded with phone calls after the Whole Foods deal was announced. Amazon’s ability to essentially enter the business overnight sent shivers through an industry already plagued by razor-thin profit margins. CEOs in other sectors wondered if theirs would be next. An Amazon spokesman declined to comment. Few analysts or investors saw it coming when the Journal reported in October that CVS was in talks to buy Aetna. CVS has a vast network that includes more than 9,700 retail locations, more than 1,100 walk-in medical clinics and a pharmacy-benefit operation that serves as a middleman between drug companies and insurers. Aetna is one of the largest health insurers in the U.S. Fear of increasing competition from Amazon helped spur CVS to look far afield for a merger partner, according to people familiar with the matter. Amazon wasn’t the only impetus. CVS sees Aetna as a way to reshape the retailer amid a broader shake-up of the health-care industry and bolster the combined company’s leverage in negotiations with drugmakers while giving it a precious stockpile of health data. CVS had begun weighing a possible transaction with Aetna before a CNBC report suggested in May that Amazon was considering entering the pharmacy business, people familiar with the matter said. As more shopping moves to Amazon and other online retailers, CVS already was wrestling with what to do with its stores. The possibility that Amazon could become a rival in CVS’s main business increased its desire for a deal that would diversify the company further and help repurpose its drugstores, the people said. CVS’s board told management to size up the potential effect of Amazon’s entry into the pharmacy business and devise a counterattack, people familiar with the matter said. Separately, CVS’s marketing department and outside advisers considered whether a partnership with Amazon would make sense. That analysis concluded that an alliance was unlikely due to Amazon’s historical resistance to such deals. Other parts of the health-care industry are feeling the heat from Amazon, too. Health-care services companies long thought they were largely immune to threats from Amazon, but the e-commerce company began adding such supplies to its website a few years ago. After starting with low-margin surgical gloves, tongue depressors and other items, Amazon now sells the top 20 basics that every doctor or dentist needs, says Jim Forbes, vice chairman in investment banking at UBS Group AG. He says some health-care services companies have begun to explore ways to diversify into different lines of business, including M&A deals, as a result of pressure from Amazon. Carl’s Jr. has a cheeky, if-you-can’t-beat-them-join-them attitude about Amazon. The fast-food chain, owned by CKE Restaurants Holdings Inc., tweeted last month: “HEY @Amazon BUY US. Srsly. For real. Let’s do this. Let’s change the future of eating!! #AmazonBuyUs.” There are no signs Amazon is interested in acquiring Carl's Jr. These three deals show how Amazon and other technology giants are influencing M&A activity.